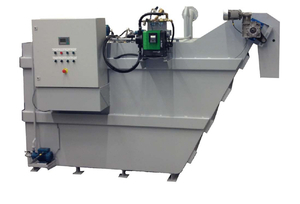 An automatically operated central unit for management of water based cutting coolants. This unit includes a 3-phase lamella separator in which solid particles and tramp oil are separated and a clean tank for the purified fluid. The unit is equipped with a supply pump delivering the purified fluid to the machine tools. An automatic coolant topping up system keeps the fluid system with constant volume and dilution rate. The feature of this system is the lean maintenance, provided by automatically operating system and the separation that does not require consumable materials. Automatically discharge of separated wastes; tramp oil and solid particles. Excellent performance in tramp oil separation. Throughput capacity: Serves up to 25 machining centers.